A good while ago, I made a little quiz of car-based haikus, and I happened to find the old file when I accidentally knocked my hard drive over and spilled hot data all over my desk. The haikus were still pretty fun, so, what the hell, let’s do it again. 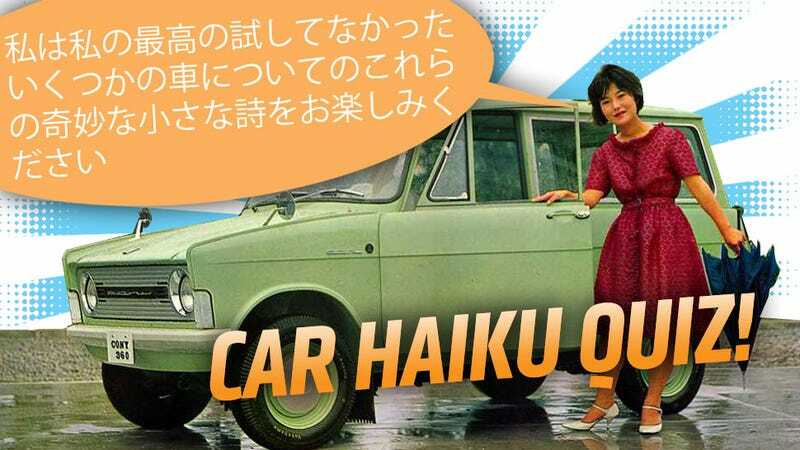 Just to refresh, the goal of the quiz is to guess the car that inspired the haiku. Haikus, of course, are based on the traditional Japanese poetic form, and I stuck to the ‘5 syllable/7 syllable/5 syllable’ rule for making these, so everything’s nice and legal. Each haiku is referring to a specific model and make of car, like a Chevy Citation or a Simca Aronde or a Fiat 850. But not those. Okay, you get it. Have at it! Good luck! I’ll post the official answers here in an update at 5:30 EST, so check back to see how you did.